Accompanied by report no. 5171874150 dated 20 September 2016 from the GIA Gemological Institute of America stating that the 92.15 carat diamond is D colour, Flawless clarity, with excellent polish and excellent symmetry; and a Diamond Type Classification letter stating that the diamond has been determined to be Type IIa. 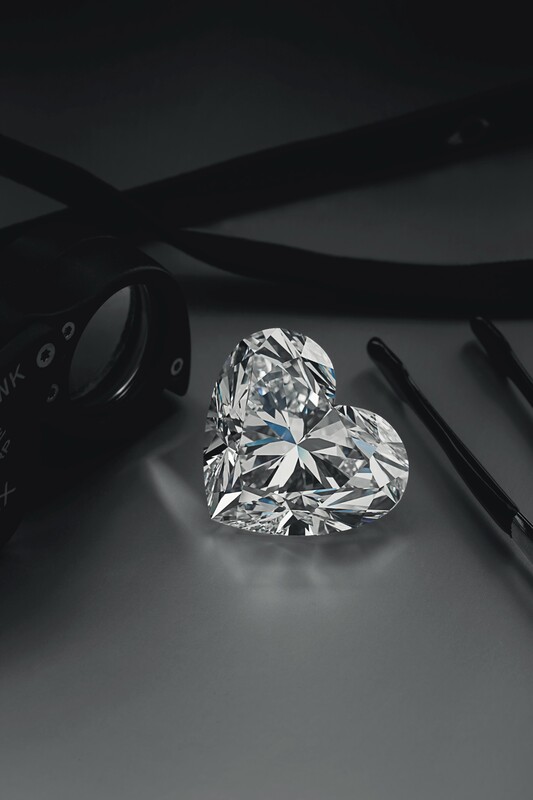 ‘La Légende’ by Boehmer et Bassenge, a 92-carat heart-shaped diamond, led the Magnificent Jewels sales at Christie’s Geneva, being sold at $14,5 million and setting a new record for any heart-shaped diamond sold at auction. The much anticipated diamond named ‘La Légende’ is a D colour and Flawless gemstone. Signed by the French high jewellery House Boehmer et Bassenge, was presented as a cultured pearl sautoir of 93cm, set between two circular-cut diamonds. The Luxury Sales at Christie’s saw another world record, set by the reference 2497 by Patek Philippe known as the Haile Selassie, that sold on Monday 15th of May for $2,9 million. A Burmese oval cut ruby ring, of 15.03 carats sold for $12,942,775 million. The ruby has no indication of heating and its colour is a ‘pigeon blood’ red. Accompanied by report no. 17040012 dated 5 April 2017 from the Gubelin GemLab stating that the origin of the ruby is Burma (Myanmar), with no indications of heating, that the colour may also be called ‘pigeon blood red’ in the trade, an Appendix letter, two Information sheets on ‘Rubies from Mogok, Burma’ and ‘Unheated rubies’ and a Gemmological Portrait. A cushion-shaped fancy intense blue diamond ring of 7.97 carats, VS1 clarity sold for $12,715,412 million, setting the world auction record price per carat. Accompanied by report no. 6187159503 dated 13 February 2017 from the GIA Gemological Institute of America stating that the diamond is Fancy Intense Blue colour, VS1 clarity. A pear-shaped D colour, potentially IF diamond pendent necklace of 56.03 by Chopard sold for $6,349,332 million. Accompanied by report no. 2185188825 dated 24 February 2017 from the GIA Gemological Institute of America stating that the 56.03 carat diamond is D colour, VVS2 clarity; also with a working diagram indicating that the clarity of the diamond is potentially Internally Flawless, and a Diamond Type Classification letter stating that the diamond has been determined to be Type IIa. A square-cut, fancy deep blue VS1 diamond of 4.05 carats sold for $4,303,092 million. Accompanied by report no. 5171955696 dated 14 October 2016 from the GIA Gemological Institute of America stating that the diamond is Fancy Deep Blue colour, VS1 clarity. A cushion-shaped Burmese sapphire of 47.63 carats sold for $2,443,612 million. Accompanied by report no. 88983 dated 6 December 2016 from the SSEF Swiss Gemological Institute stating that the origin of the sapphire is Burma (Myanmar), with no indications of heating. A ruby and diamond Trèfle a quatre feuilles brooch by Boucheron sold for $2,224,372 million. Accompanied by report no. 90447 dated 28 February 2017 from SSEF Swiss Gemmological Institute stating that the origin of the rubies is Burma (Myanmar), with no indications of heating, and that the colour of the 3.20 carat ruby may also be called ‘pigeon blood red’ in the trade. Further accompanied by copy of insurance valuation dated 23 November 1982 from Boucheron. A round brilliant-cut D colour, flawless diamond of 16.19 carats sold for $2,200,012 million. Accompanied by report no. 1172454214 dated 17 February 2016 from the GIA Gemological Institute of America stating that the diamond is D colour, Flawless clarity, with excellent cut, excellent polish and excellent symmetry; and a Diamond Type Classification letter stating that the diamond has been determined to be Type IIa. A round brilliant-cut, D colour flawless diamond of 15.09 carats sold for $2,139,112 million. Accompanied by report no. 6177716183 dated 30 August 2016 from the GIA Gemological Institute of America stating that the diamond is D colour, Flawless clarity, with excellent cut, excellent polish and excellent symmetry; and a Diamond Type Classification letter stating that the diamond has been determined to be Type IIa. A cushion-shaped Kashmir sapphire of 14.88 carats sold for $1,999,042 million. Accompanied by report no. 90710 dated 7 March 2017 from the SSEF Swiss Gemmological Institute stating that the origin of the sapphire is Kashmir, with no indications of heating, and an Appendix letter stating that this sapphire is ‘characterised by an attractive blue colour and an excellent purity, a combination rarely encountered in sapphires from Kashmir of this size’. Report no. 1081357 dated 27 January 2017 from the AGL American Gemological Laboratories stating that the origin of the sapphire is Kashmir, with no gemological evidence of heat and no clarity enhancement. Furthermore, the private collection of Eric Nussbaum, the initiator of the Heritage Cartier collection, and one of the most eminent Cartier experts, sold 100% of its lots, reaching $693,176. Its top lot, a natural pearl necklace, doubled its pre-sale estimate and sold for $100,781. Accompanied by report no. 89137 dated 13 December 2016 from the SSEF Swiss Gemological Institute stating that the 65 pearls are saltwater natural pearls. Last but not the least, the fascinating section focusing on Italian jewellery and called ‘Dolce Vita’ was highlighted by a one-of-a-kind sautoir signed Bulgari, from the collection of actress Silvana Mangano. The necklace came to the actress through the stylist Piero Tosi, who was working on the set for “Gruppo di Famiglia in un interno”, directed by Luchino Visconti in 1974. Tosi freely chose from Bulgari’s 1970s collection for the role of La Marchesa Bianca Brumonti, interpreted by Silvana Mangano. This outstanding necklace sold for $190,312, tripling its pre-sale estimate. With an overall sell through rate of 88% by lot, the first set of Luxury Sales confirms that the market is confident and growing with significant participation from Asia.